I spotted this on Ebay & couldn't resist! It's an old 8x10,and her name is/was Gina- it's written in pencil on the back. The seller was at an estate sale & picked it up-while I'm glad to have it,it saddens me for her living relatives that they'll never get to have this in their family. I'll be buying a frame with UV glass so the daylight doesn't do damage to the photo. I'm wondering what decade this was taken in. 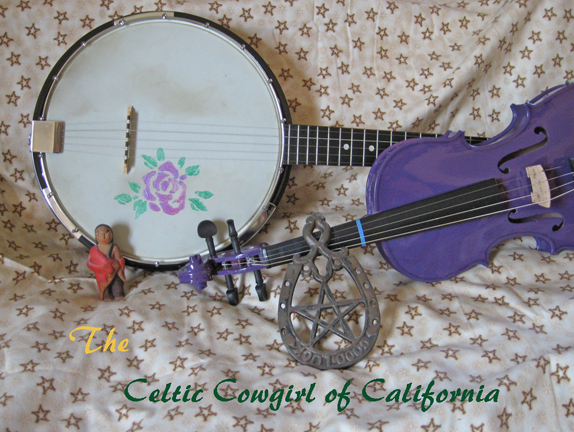 She sure has a pretty inlaid tailpiece on her fiddle-wonder where that went off to? She certainly looks spunky. I don't mind telling you this is messy work and I've already cut out pattern pieces for an apron-my 1st apron,which will be my "fiddle fixin" apron. I need to sand the white milky stuff off & have ordered a stencil or two for the widest point of the fingerboard. Good thing I did the scraping outside! And yes,there will be a 2nd cookin apron on the way once the other one is done. Luckily,I have a simple pattern & lots of fabric. The weather has held beautifully-very little rain,partly cloudy skies,and the birds are singing like crazy in the mornings. No robin spotting yet. And isn't she a beauty? Another win from an auction site that has the $$ go to charity. This one came in a beautiful case-and obviously needs parts,which I'm shopping for now. I want to take the rest of the finish off the fingerboard-the natural wood looks much more beautiful than the overly thick "traditional" finish it's sporting now. And I won a how to repair violins DVD to boot so I'm waiting for that to arrive. This will be my "performance" fiddle. You wouldn't believe the size of the box it came in-it was so big & boxy I thought I was receiving the wrong item at first-it could've held a decent sized A/C unit it was so big-and I had to go thru a ton of styrofoam peanuts just to find it. Luckily for me,the sound post is in place. I've been treating it with a humidifier so the wood is nice & plump for when I start working on it. Needless to say,I'm anxious to hear what she sounds like. It's feeling like spring-and the apricot tree in the back is beginning to bloom already-hoping I don't lose blossoms in the predicted rain for this Saturday. I haven't seen my first robin yet tho! If that wasn't enough,I received my sample issue of "Fiddler Magazine" yesterday and it's wonderful-definately subscribing with the next issue-has article s for players & luthiers alike. SO I'm reading away,and continuing to study my mandolin & fiddle. Honestly folks,I don't know where these ideas come from. It's like the Universe just plops em in my head,making sure I have the tools I need first-even if it means I buy sewing tools for no apparent reason! For instance-last year I got a bee in my bonnet and simply had to have a set of circle templates. I had no idea what they were for aside from cutting circles out of fabric. Into the sewing box they went,and stayed there for months. Some time later I got a copy of "Mary Jane's Stitching Room" on sale & was leafing thru when I spied the chapter on yo yo making. An "Ah-ha!" flashed thru my mind as I thought of those circle templates immediately. I've been wanting to gussy up my fiddle-mandolinists,guitarists,banjo players,etc get to do that by using different colorful straps. Needless to say fiddlers don't use straps,and the only decorating that I could do in my opinion was on the headstock,on the scroll,and make sure there was nothing used that would scratch. So I came up with 2 different sizes for 3/4 size & under (in the picture above) and a larger size for those playing full size. I'm wondering if other "fiddle chicks" would want these on their fiddles,or am I just wierd? I always enjoy making items that are useful for musicians,& I'm acting today on an idea that cropped into my head last week sometime. Fiddlers always need to wipe the instrument & bow down after playing as the rosin dust that flies off the bow can damage the varnish of both if left to rest on the instrument. However,I've noticed my commercially made cloths are feelin very grungy and look boring & dirty. However,they're not machine washable. Where's the sense in that? So today before the Superbowl I'll cut out a template and sew some. I've got some lovely cotton prints that'll do the trick. My fiddle is completely restrung and I have the luxury of having two different types of rosin. My fiddle library is growing as I absorb tips for beginners. I'm hoping the fixer upper I got off Goodwill Auctions comes tomorrow-she looks lovely in the pic and I can put my budding luthier skills to work,not to mention I'll have a decent case for the one I'm learning with now. I'm for the Saints today-really hoping they'll win the game and have their 1st Superbowl win. Then I get to deal with my annual case of football withdrawl.......and remember what I do during the off season,then become grateful for all the seemingly extra time on weekends!